Here's my confession (why am I always confessing on Blog Action Day? ): I tend to only think of water as a medium for tea. 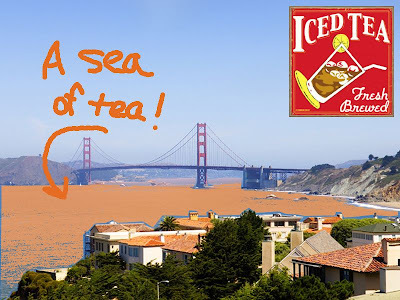 If iced tea were made with milk, I would undoubtedly be less concerned about the state of water in the world. If it were made with vodka, I would likely be unconcerned about anything. But, here's the deal: The average American uses 159 gallons of water every day – more than 15 times the average person in the developing world. From showering and washing our hands to watering our lawns and washing our cars, Americans use a lot of water. To put things into perspective, the average five-minute shower will use about 10 gallons of water. Basically, we use the amount of water during one (short) shower that people in developing countries use to bathe, wash their clothes, cook their meals, and quench their thirst. My god! If I had known how much water you all were wasting, I would have gone postal by now. Think of the tea! The little leaves yearning to add some color to that otherwise colorless, flavorless (let's admit it: boring) but oh-so-precious water. For me, this was an "H2-Oh-no-you-didn't" moment. Say "No, thank you" to water at your table when you eat out if you don't really want or need it. Besides, why would you fill up on water when there's so much wine to be tasted? Turn off the water when you're brushing your teeth. Or just stop brushing your teeth. Gum works just fine. Quit watering your hideous lawns. You're not the King of France for Christ's sake and this isn't Versaille. Get some local plants and do some environmental landscaping. Stop washing dishes. Just buy those paper or plastic plates and throw them away when you're done. Babies are small. Give them less water. Thanks for reading and Happy Blog Action Day! Linked over here from filterfast and oh my. You so have a new follower. Spectacular post today. Now to go back and see what I've been missing! 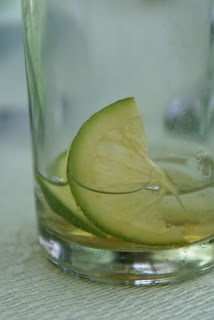 By eating lush fruit and vegetables you can avoid drinking any water. But it does make you fart like thunder. Alise, thanks so much for the link and the follow! I hope you find something else here that amuses you. GB, I will try to avoid fruit now at all cost.